Forster & Andrews built the old organ for the church in 1870, an organ of two manuals and pedals with five stops for each of swell and great and one pedal stop. In 1881 they added a mixture stop to the great organ and in 1904 Morgan & Smith added some more stops using pneumatic action; Norman Hall revised the specification further in 1970. (Thank you to Michael Whitehall for this information). The organ site remained as originally built; the case at some subsequent date was painted white, as were the church walls. Stencilling previously abounded on both woodwork and walls and the outline can still be seen on those pipes at the east end of the case. The design for this Bower organ makes the best of the old organ to provide a new 2 manual and pedal organ with mechanical action. 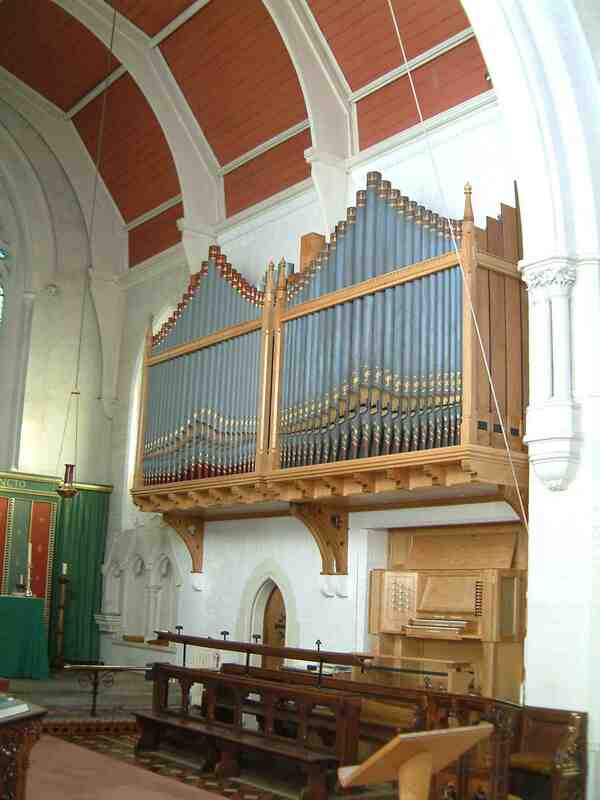 It uses the Forster & Andrews pipework of the old organ and everything else is new apart from the old case, now moved forward 12 inches and competed and repolished in natural oak. This case above the console contains the Great organ with the swell organ behind with the swell shutters projecting solely into the church. The case to the left of the old case is entirely new and this contains the new pedal organ, of five stops; the new façade pipes forming the Pedal Principal 8ft. As there is no arch behind this case the fine wires of the mechanical pedal action can just be seen running neatly across the gap between the two cases. The Pedal Mixture marked IV ranks actually has V ranks, 4, 2 2/3, 2, 1 1/3, 1.